Did you pack away Christmas yet? While carefully wrapping ornaments to hide back in tattered boxes, I realized that I am guilty of thinking the sweet Babe in the manger can only be celebrated during the short Christmas season. What about you? But as a friend said, “He is the reason for every season, not just Christmas.” She’s right! The Incarnation is a story that should be told, remembered, and shared all year long. 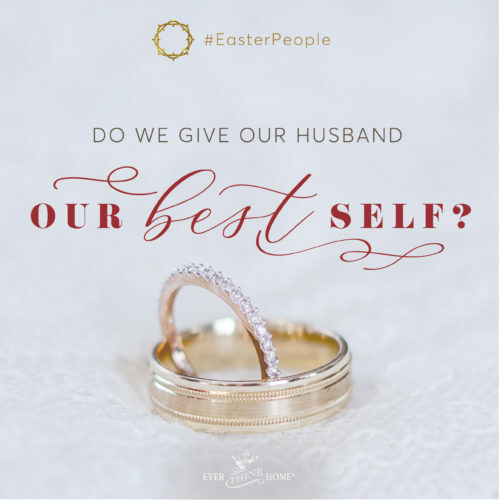 I’ve always meant for my home to reflect Him in every season. So when I first began crafting the Adorenaments®, I hoped I would find ways to use them in my home beyond the month of December. Yes, I planned to leave them up after Christmas! 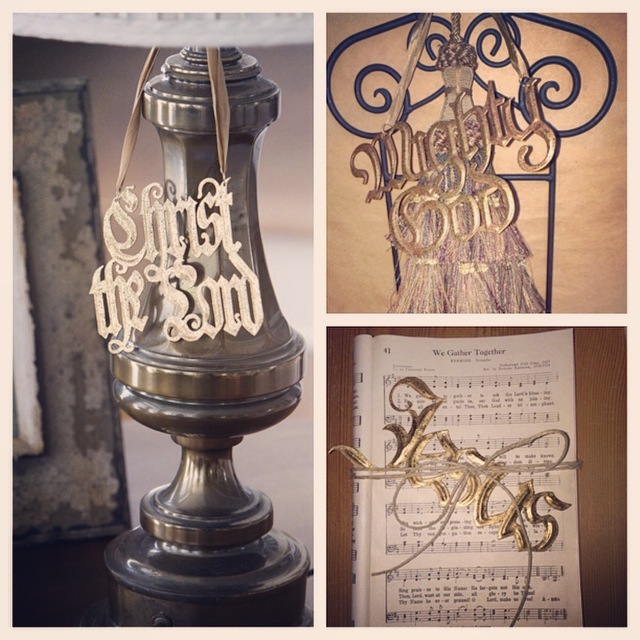 Thankfully, now decorating my home with reminders of Jesus’ story has become a year-round reality. It can be for you too! 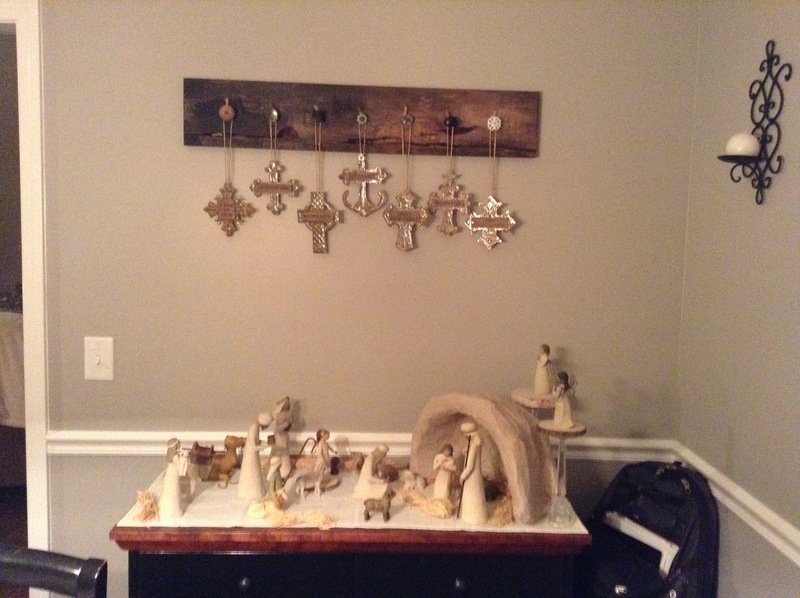 Here are six easy ways that I’ve displayed the names of Jesus in our home year round. 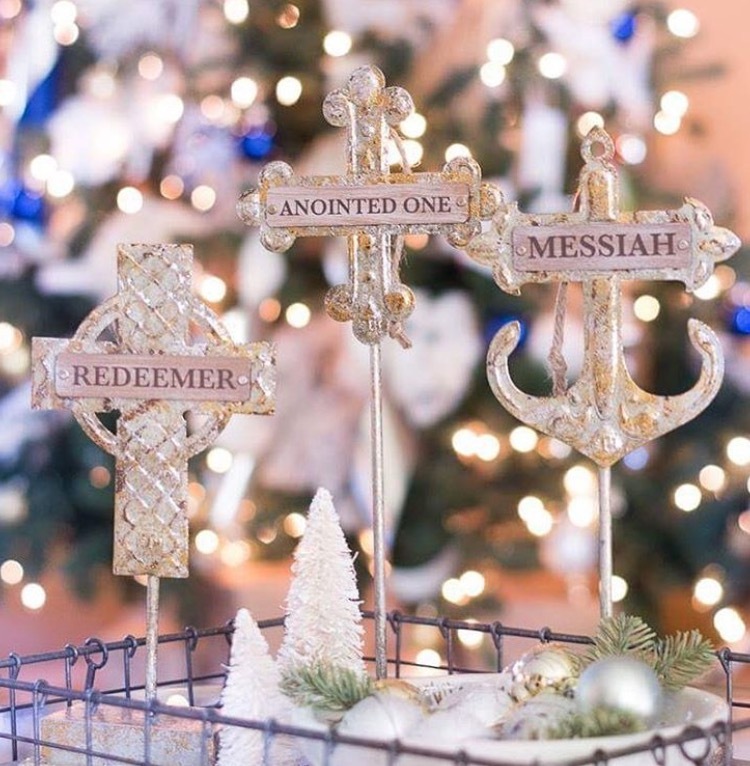 Add His Advent Names to a tiered tray for a daily reminder that Jesus is the Son, Light, Word and Messenger. 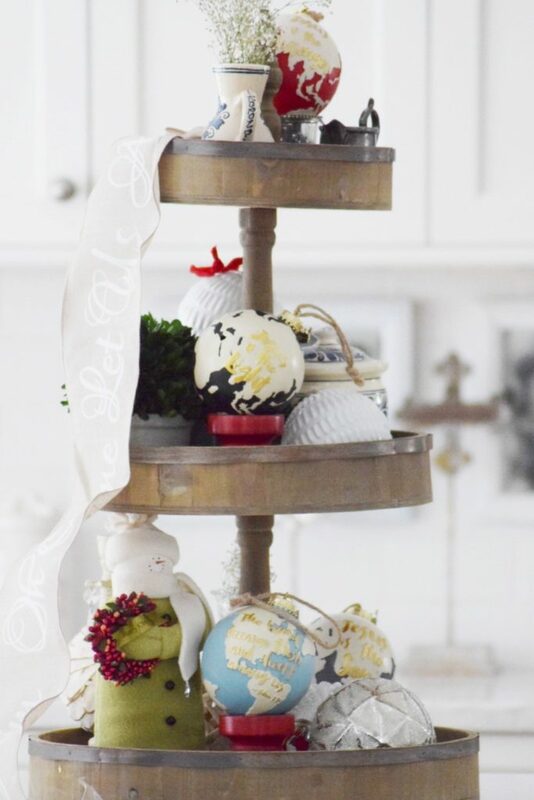 Our friend Kellie displayed her set with various winter decor items and we think it’s lovely. You can also add them to a clear glass bowl to make a lovely centerpiece for any dining room table, coffee, or side table. 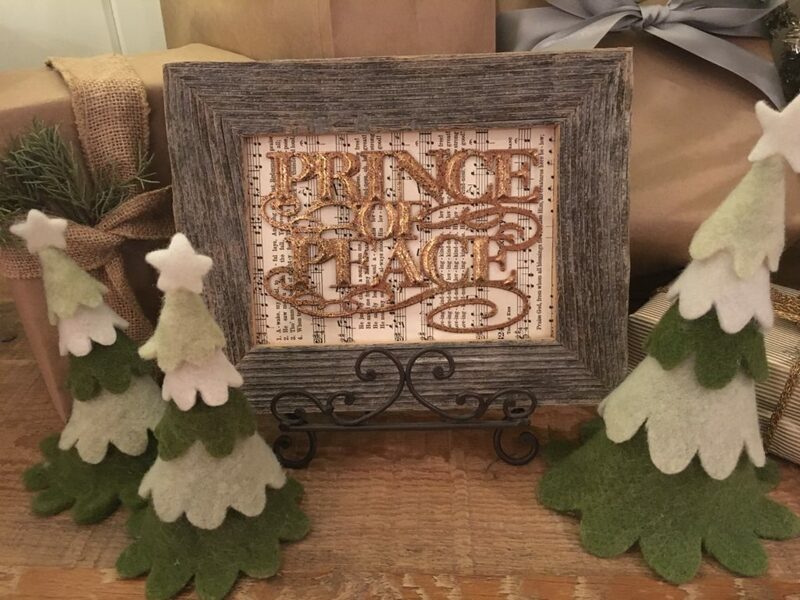 Frame the ornaments for meaningful home accents. I found a vintage frame at a flea market. Then I removed the glass and added a page of Christmas music torn from an old hymnal, also a flea market find. Choose your favorite name, depending on your frame size, from His Christmas Names. Mine is propped on an easel on my entry table. 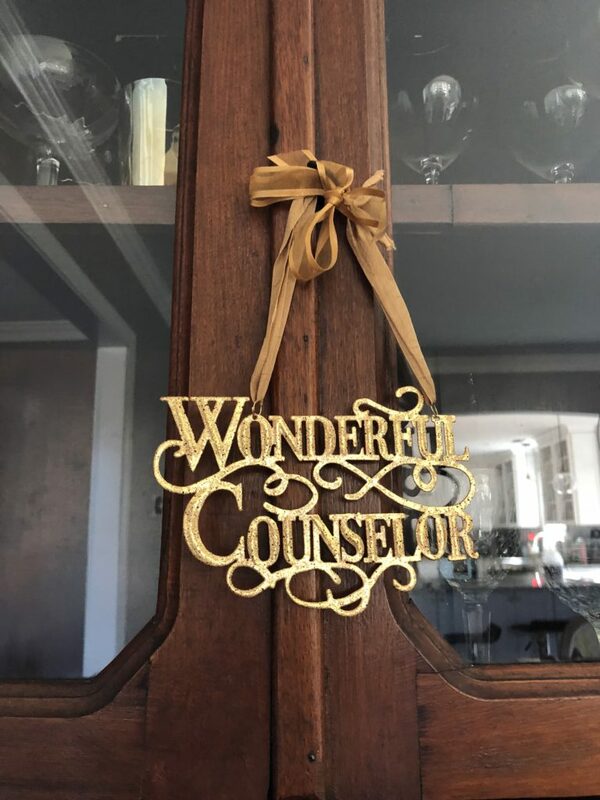 But you can hang yours anywhere in your home for daily reminders of His year-round nearness that began that first Christmas morning. 3. Get creative. His Savior Names are designed to be displayed both on Christmas trees and on stands. (A set of three stands of varying heights is available here.) Kendra, another friend of ours, displayed hers beautifully in a wire basket with tiny trees and various vintage ornaments. After Christmas ends and winter fades, remove the trees and ornaments and add a pink flower and more spring decor items to the basket. 4. Add Jesus in the details. 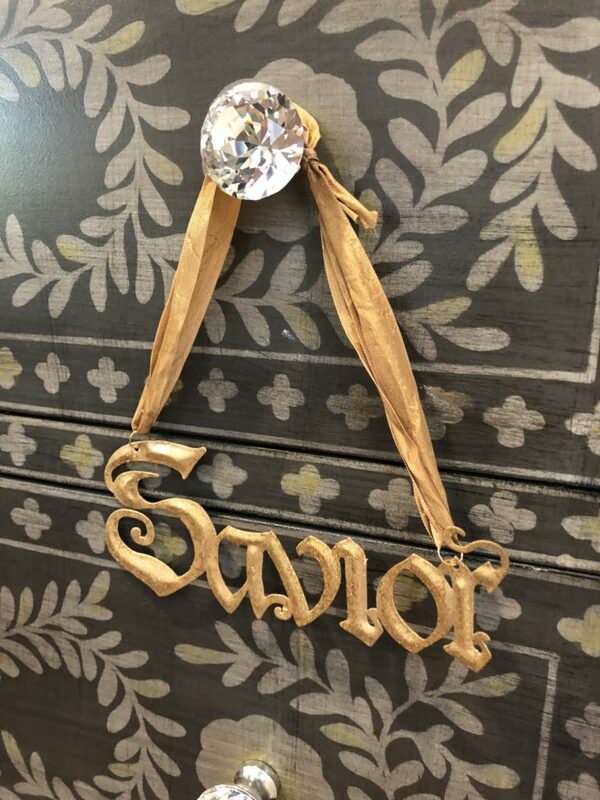 I added a few more names of Jesus to other places in my home: the key on a secretary and resting on a beautiful crystal knob adorning a cute dresser, a fitting image of His resting in our words of worship. 5. Brighten a window. 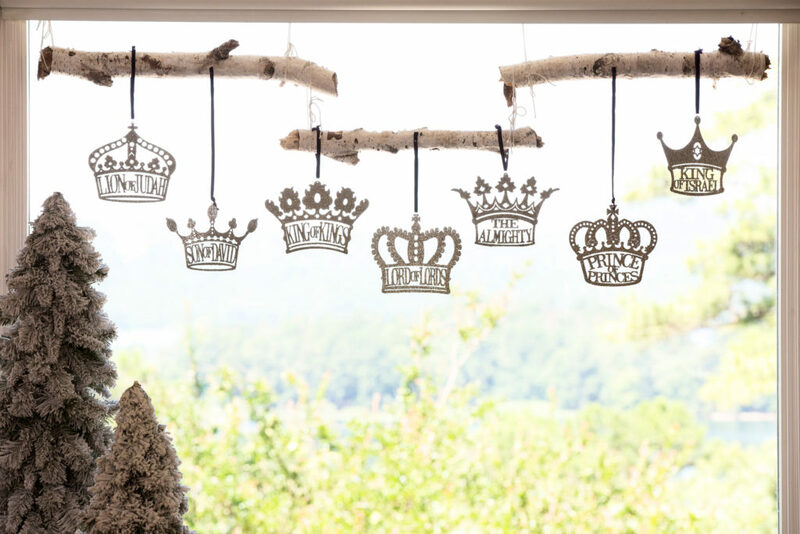 I was so delighted with the glittered crowns royal names of Jesus. I couldn’t just box them away. So I hung all seven of them on one-inch diameter birch logs in my kitchen window. (I saw some birch logs at Kroger the other day!) You can easily do the same with birch branches you find or with any other kind of branch. Spray paint them white to mimic birch logs. The sun will make them sparkle by day. By night, their silhouettes declare that Jesus is Lord of all twenty-four hours each day. Mine are now slightly tarnished from the continuous exposure to the air and our strong summer sunlight, but I love them just the same. 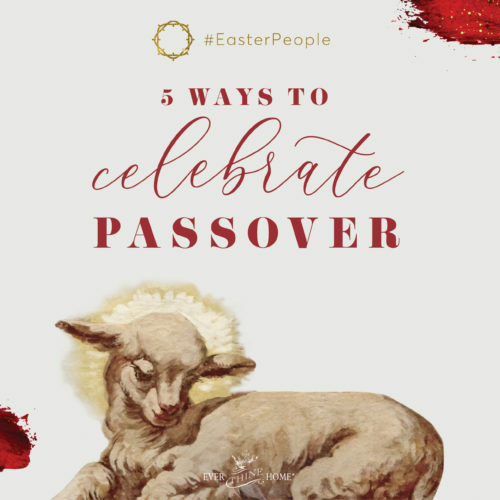 How are you planning to keep Jesus in the forefront of your home and heart throughout the year? Comment below with an idea or picture. We love hearing your ideas! 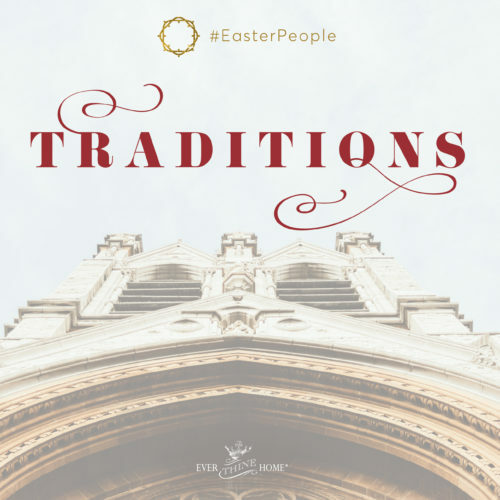 And we love to spread them to others so that all of us can creatively display the names of Christ year-round. I love the adornments! I have all 3 sets. I use the Christmas names on a prelim wreath hanging on the wall. 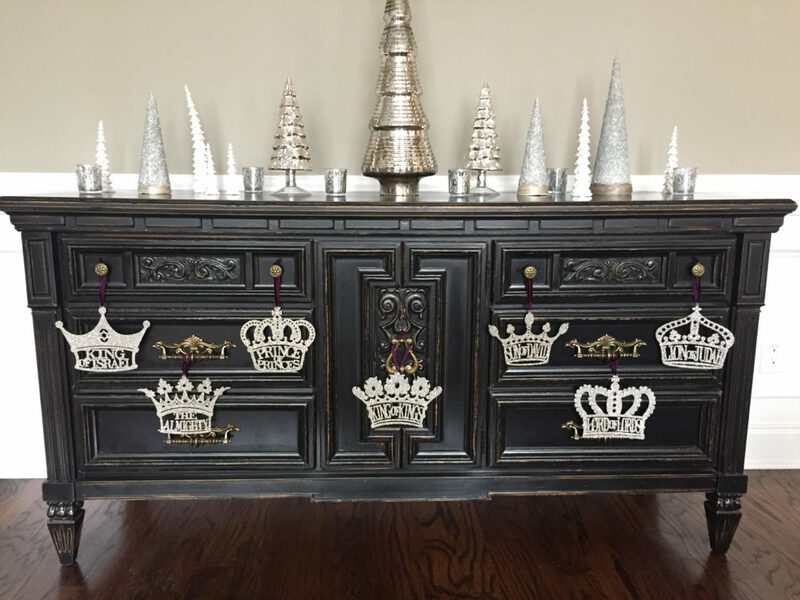 I use the royal names in garland on the mantle. 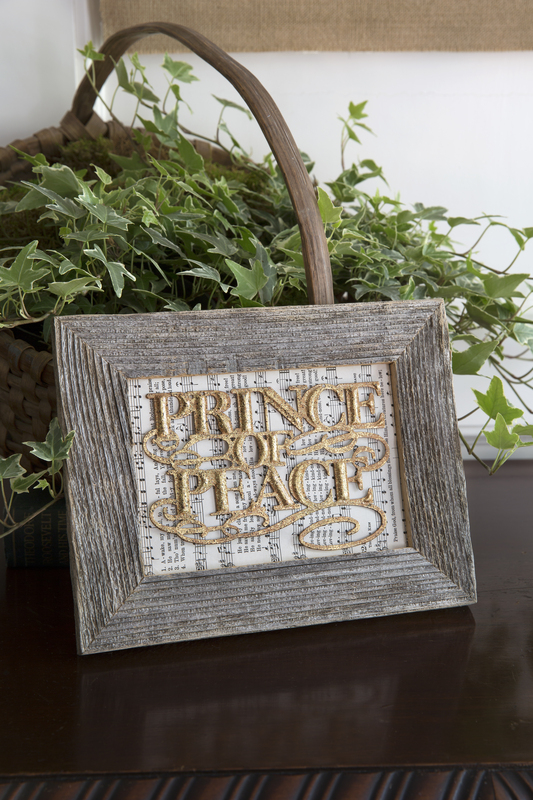 I use the savior names year round on a piece of distressed wood with decorative knobs. Thanks Barbara for creating Ever Thine Home, I have enjoyed adding pieces to our home. This is the first year v to buy the adornaments.. The globe ornaments with the names and messages of Jesus. They were helpful reminders to keep Jesus at the heartb offv the season’s. And I will beer keeping them up year-round. Planning to put the Crowns in a couple of narrow frames with velveteen backing. I will be placing these in the entry of our home.